Conor McGregor’s Proper No. Twelve whiskey has sold out across the US and Ireland, after less than two months on shelves. The MMA fighter has apologised to fans after the ‘incredible reaction’ to Proper No. Twelve’s launch in September has led to six months’ supply selling out in just several weeks. McGregor said he ‘doesn’t usually see reason to apologise’ but felt moved to after visiting customers, bartenders and distributors in Ireland and the US where stocks have already run out. 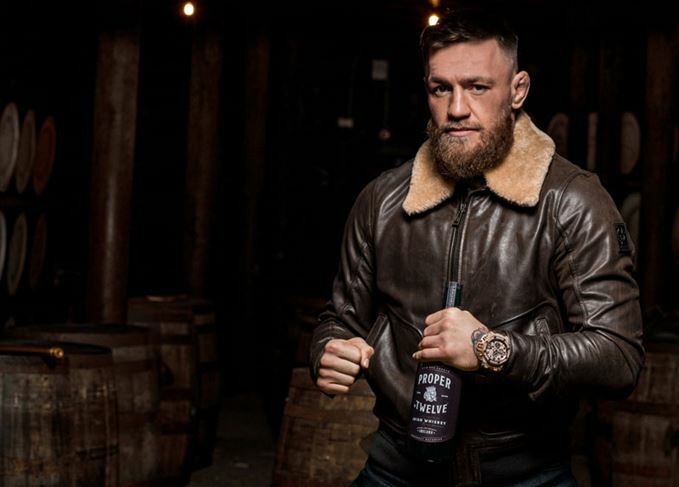 ‘I told everyone as the company founder that I was going to give it my all and take the whiskey market by storm,’ McGregor said. ‘The feedback on our liquid and brand is outstanding and the support from people around the world has blown me away. The triple-distilled blend of Irish single malt and grain whiskeys, produced in partnership with Bushmills distillery in Northern Ireland, is expected to be back in stock in early December. Eire Born Spirits, the drinks company founded by McGregor, intends to launch Proper No. Twelve in more countries in 2019, including the UK, Australia, New Zealand, Russia and Canada. The company also intends to release further expressions in the range, which will launch ‘when they are proper ready for release’. McGregor added: ‘The Irish whiskey market has been dominated by one brand, but people want choice. The whiskey brand is named after the Crumlin, Dublin 12 neighbourhood in which the MMA World Champion grew up. For each case sold, US$5 will be donated to local first responder organisations up to US$1 million annually.